Well it’s over. Sort of. At the moment Zoe is lying on the floor, wearing her pink polka-dotted Hello Kitty rain boots, watching her new Sid the Science Kid dvd, rolling a ball around, and hugging Ralph. She ate a little lunch, downed her tylenol and antibiotic, allowed us to apply goop to her stitches, and devoured a vanilla pudding reward. Today has already been a much better day than yesterday. Her energy level is definitely back to normal. We were expecting maybe 50% after she was at zero yesterday following the surgery, but she ramped up to 100% after a good night’s sleep. Her resilience is impressive. 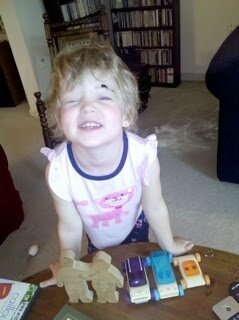 Today we’ve played legos, play kitchen, and dolls. And watched some tv. I have completely abandoned my usual guilt feelings about the tv because I think the sitting still is good for her and using both her eyes. Looking at her eyes is kind of unsettling. Not because of the stitches, which are scabbing over. But because she doesn’t look like herself. For three years we’ve known that her eyelids were droopy, and that the ptosis in her left lid was more severe. But that’s just the way she was. Sometimes her left eye opened more than other times. Now her left eye is open, and open wide. And her right lid, which always seemed normal, now seems like it’s less open than the left. It’s kind of freaking me out. The doctor said that her right lid will probably lower a little as time goes on, but it’s unlikely they’ll be exactly even. It seems so strange to see her eyes uneven now because it wasn’t just the way she was born, it was something that was done to her. It’s great that it was done, because she will be able to see better, but it’s still very unsettling. It is likely that she will have another surgery in a few years, which will probably be on both lids to make them even. Already not looking forward to that, but I’ll try not to think about it. The reason she would have to have another is because the material they used yesterday is artificial, and doesn’t last forever. When she’s older they would use human tissue, either from a cadaver or her own leg. That tissue would grow as she grows and keep her eyelid muscles opening for good. Thinking too much about all that makes my stomach clench and my head swim. 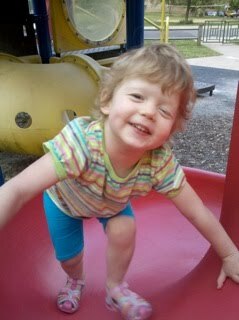 In the meantime, I am so relieved to see her playing and joking around instead of wailing and clutching to us, or throwing up. Hallelujah. Randy and I are both feeling buoyed by all the love and support and encouragement we’ve received over the past few days. My parents were at the hospital with us yesterday and picked up prescriptions and lunch for us yesterday. Friends have brought us dinners, snacks, and baking soda. Friends took our pukey rug to the dry cleaner. Another friend is bringing her steam cleaner over tomorrow. And the messages of empathy and compassion and love we’ve received by email and on Facebook and by phone have given us much comfort. We’re supposed to keep Zoe home for a week while her eye heals. Day one is going well. It helps that it’s chilly and rainy so she hasn’t yet asked to go to the playground, which is prohibited because of the sand. She also hasn’t requested a bubble bath, on one of her favorite activities, also prohibited for a few days so soap doesn’t get in her eye. And rejoining her preschool rugby team is definitely out of the question. But the bulbs we planted in the backyard have started to sprout, and the two little pots of basil have sent tiny green leaves shooting up through the dirt. We will find new things to do to amuse ourselves. Pictures: top: the day before surgery. middle: waiting for the surgeon. bottom: the day after. So this weekend we launched Phase I of Tell Zoe About Her Operation. Kind of by accident. Last week I ordered some Caillou videos from Amazon. Caillou is one of Zoe’s favorite shows. It is not one of mine. Mainly because we have seen every Caillou episode that exists, many multiple times. We own two Caillou dvds and we have watched those so many times that I am often tempted to destroy them, or at the very least hide them. But I get the impression that Zoe finds Caillou comforting. So I ordered some new ones for after the surgery. We arrived home after a family outing to the playground and the package was on our doorstep. Somehow it was opened. Of course, Zoe was excited and wanted to watch immediately. We figured then was as good a time as any to explain. So we sat her down and said the Caillou videos were a treat for her after the operation she was going to have. I said in a couple weeks we would go to the hospital, just like Franklin (the turtle) goes to the hospital and Curious George goes to the hospital. Zoe loves reading about and playing doctor. We recently got a book from the library called Daisy the Doctor and we’ve all read it to her many times. And she knows Mommy and Daddy and Poppy have all had operations and come home needing to rest, but otherwise ok. So I briefly explained that the doctor was going to work on her eye so it can open more and that will make it easier for her to see. And afterward we’ll go home and watch videos. She said “OK” and slid off my lap to go play. I imagine this information will be simmering in her brain and she’ll come back soon with questions. Then we’ll launch Phase II, whatever it may be. It turns out that in addition to being attached to my bank and credit cards, driver’s license, and all those frequent buyer cards that were in my wallet, I was also attached to the wallet itself. I had to buy a new one today after my wallet was stolen last night. The new wallet is a cheerful red, but it seems sad and desolate because it is completely empty. Not even loose change. I doubt I will ever remember all the cards I had in there. Perhaps I didn’t really need them. What I really hope is that they’re in a trash can somewhere, discarded by the wallet thief rather than in use. I would hate to think the thief is on his way to get a free smoothie because my smoothie card already had enough holes punched. I am reminding myself over and over that it’s a hassle but it’s just a thing. Last night it seemed overwhelming, like yet another item in the list of unfortunate events in my family’s lives as of late. But it’s just a thing. Just a thing. And the police officer who came to make the report and the people at the bank were all very friendly and helpful. 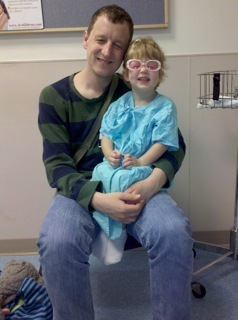 Today Zoe had her 3-year checkup with the pediatrician, who pronounced her healthy. The phone rang today and a new client was on the other end. It’s spring. We have a house. Randy has a job. Zoe wrote her name the other day. These are all infinitely more important than the frustration of losing a wallet. It’s just a thing. The other night at bedtime Zoe suddenly sat up and very earnestly said to me “Mommy, I really want to have a baby in our family.” Oh man. So do we, Zoe, so do we. I explained to her that Mommy and Daddy really want a baby in our family too, and that we’re doing our best to make that happen, but that it can take a long time for the baby to appear in Mommy’s belly. Zoe routinely begins conversations with “When I’m a big sister…” and “When we have a baby we can…” and “This would be a great toy for our baby!” All as if I am pregnant and about to deliver her into big sisterhood any day now. I wish. When I was pregnant last fall, I hoped that Zoe would catch the big sister vibe from two good friends of ours whose second babies were expected to arrive in November and December. I guess it worked. Even though she can’t read, Zoe is a keen observer and when we go to the library, she manages to find every available book about babies, having a new baby, and being a big sister or brother. Maybe she does recognize the word sister, or just knows a baby picture when she sees it. Sometimes it wears me out to read all those books about big sisters and new babies. Frequent reminders of what I haven’t yet been able to achieve. At bedtime she also frequently asks me to tell the story of when she was born, and she has drawn several pictures of me when I was pregnant with her. She even knows the word pregnant. We hadn’t told her last fall that I was pregnant, precisely because we didn’t want to have to tell her if I suddenly wasn’t, which turned out to be the case. I wonder if we’ll be able to hold off next time (assuming there is a next time, praying and hoping that there is and it is sooner rather than later) because somehow I feel like she’ll sense it with her baby radar and the acute awareness of a big sister in training. Thank you to my friend Tammy for sending me this poem by Maya Stein. It seems apropos. Maybe the camera crew is at someone else’s house, a spotlight haloing over another’s fleshy story. Maybe the mailman is delivering the good news to your neighbor, or a different city entirely,and you come home to a rash of catalogues, the second notice for a doctor’s bill, a plea from the do-gooders for whatever you can spare. Maybe you haven’t cleaned your kitchen floor in weeks, forgotten to nourish the front garden, spilled too much coffee in your car, weaving through traffic. Maybe you are 10 pounds heavier than last year. Maybe your skin is betraying your age. Maybe winter is ravaging your heart. Maybe you are afraid, or lonely, or furious, or wanting out of every commitment you entered with vigor and trust. Maybe you’ve bitten your nails down to the quick, chosen your meals badly, ignored the advice of those who know you best. Maybe you are stubborn as a toddler. Maybe you are clumsy or foolish or hasty or reckless. Maybe you haven’t read all the books you’re supposed to. Maybe your handwriting is still illegible after all these years. Maybe you spent too much on a pair of shoes you didn’t need. Maybe you left the window open and the rain ruined the cake. Maybe you’ve destroyed everything you wanted to save. If anything, believe in your own strange loveliness. How your body, even as it stumbles, angles for light. The way you hold a dandelion with such yearning and tenderness, the whole world stops spinning.